As we approach the halfway point of the Blancpain Super Trofeo 2014 Asia Series, the excitement could not be more intense as racers make the first of two stops in China at the Zhuhai International Circuit. Most racers have never raced on this track and this race comes close on the heels of the Fuji stop, giving competitors little time to prepare. In the three years of the Super Trofeo, this is the first time that China has hosted two separate events and the first time that the Zhuhai International Circuit has been selected as a race site. The increasing popularity of motorsport in China and the proximity of Zhuhai to Macau, home to the Macau Grand Prix, and the international metropolis of Hong Kong, has driven the popularity of this track.
. Opened in 1996, the Zhuhai International Circuit was originally designed for Formula 1 racing, but has since become a hotbed of regional motorsports attracting teams from Hong Kong as well as Macau setting up garages. The track's combination of straights into as many as 14 turns, some sudden hairpin turns, requires strategic braking from drivers and careful management of tire and brake wear.
. 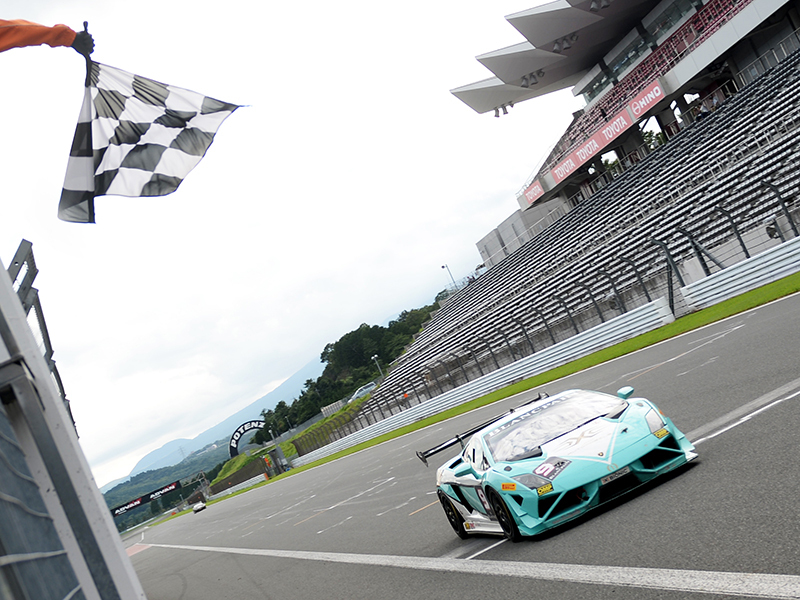 Arrival of the Super Trofeo in China is also a homecoming for car #9 and Chinese driver Jiang Xin, who has taken first place at each of the first three stops of this year's series. The pressure will be on for Jiang Xin, whose outstanding performance will be put to the test in a very different way as he lines up against his fellow countrymen and racers that are more familiar with the tricky layout of the Zhuhai circuit.
. Another challenge for racers at Zhuhai is that it comes hot on the heels of the Fuji stop only twenty days prior. Racers, who usually spend more than a week preparing, have a very limited amount of time to get their cars to the location and on the track before the actual race begins. The mental and physical endurance necessary for this race, especially from a majority of non-professional drivers, many of whom will be on this track for the first time, is considerable.
. Zhuhai promises to set the stage for the latter half of the Lamborghini Blancpain Super Trofeo, which will continue on to Shanghai nearly a month later, then return to the more southern latitudes of Malaysia for the World Final in Sepang.